November 2, 2004: New York Times headline– Drought Unearths a Buried Treasure. “Escalante, Utah – In the early 1960′s, the nation’s environmental movement cut its baby teeth on a fierce battle to stop construction of dams along the Colorado River. Two proposed dams were never built, but Glen Canyon dam, located in an unprotected area, was completed in 1963. Over the next 17 years, water backed up for 186 miles, forming Lake Powell and inundating Glen Canyon and hundreds of miles of side canyons. What Mr. Abbey and the Sierra Club couldn’t or didn’t do nature has now accomplished. A severe Western drought – some say the worst in 500 years – is shrinking Lake Powell at the rate of up to a foot every four days. Since 1999, the vast reservoir has lost more than 60 percent of its water. This entry was posted in Year 7 TDIWH and tagged drought, Glen Canyon Dam, Lake Powell, water, water history on November 2, 2018 by safedrinkingwaterdotcom. This entry was posted in Year 6 TDIWH and tagged drought, Glen Canyon Dam, Lake Powell, water, water history on November 2, 2017 by safedrinkingwaterdotcom. This entry was posted in Year 5 TDIWH and tagged drought, Glen Canyon Dam, Lake Powell, water, water history on November 2, 2016 by safedrinkingwaterdotcom. This entry was posted in Year 4 TDIWH and tagged drought, Glen Canyon Dam, Lake Powell, water, water history on November 2, 2015 by safedrinkingwaterdotcom. This entry was posted in Year 3 TDIWH and tagged drought, Glen Canyon Dam, Lake Powell, water, water history on November 2, 2014 by safedrinkingwaterdotcom. This entry was posted in Year 2 This Day in Water History and tagged drought, Glen Canyon Dam, Lake Powell, water, water history on November 2, 2013 by safedrinkingwaterdotcom. November 2, 2004: New York Times headline— Drought Unearths a Buried Treasure. “Escalante, Utah – In the early 1960’s, the nation’s environmental movement cut its baby teeth on a fierce battle to stop construction of dams along the Colorado River. Two proposed dams were never built, but Glen Canyon dam, located in an unprotected area, was completed in 1963. Over the next 17 years, water backed up for 186 miles, forming Lake Powell and inundating Glen Canyon and hundreds of miles of side canyons. 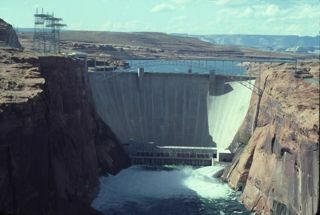 This entry was posted in This Day in Water History and tagged drought, Glen Canyon Dam, Lake Powell, water, water history on November 1, 2012 by safedrinkingwaterdotcom.